A Tarantino-styled crime film that could have been made back in the 1990s when Pulp Fiction and Reservoir Dogs inspired a zillion knock-offs by eager young filmmakers, Catch .44 boasts a marquee cast and nice noir-ish sheen, but its story and method of storytelling just don’t deliver. 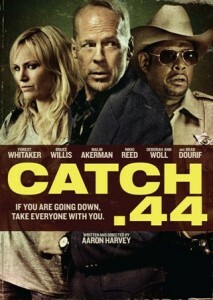 Malin Akerman works hard for the money in Catch .44. The gimmick, which really isn’t a gimmick anymore these days, is that the story is presented in a splintered chronology, opening on the three women in a diner at night as they stand off against a couple of dudes with guns, and then flashing back frequently to the events of the day that led them to that point. So you’ve got to pay attention if you want to really follow what’s going on. But you’ve already seen what’s going on in this kind of exercise plenty of times. The movie’s pace is actually solid, but the herky-jerky, back-and-forth works against the story, yanking us away from each section rather abruptly and not giving us much of a chance to care about the players. The jumping around is usually punctuated by some hard, bloody violence, which doesn’t enhance what’s going on in the narrative as much as distract from it. The not-so-clever dialog is in the Tarantino-esque hip/tough mode, which the cast delivers adequately as they’re undoubtedly familiar with the style. More interesting than Catch .44, or at least more engaging, is the commentary track by filmmaker Harvey and editor Richard Byard (Waking Madison). Harvey, who’s only feature film prior to Catch .44 is the straight-to-DVD slasher flick The Evil Woods (2007), notably discusses how he didn’t think his screenplay would attract the interest of so many A-list actors when it was being passed around Hollywood. Apparently, Malin Akerman was the first to raise her eyebrows, and the others quickly fell into place. The budget was adjusted commensurate to the talent involved and the next thing Harvey knew, he was on location in Shreveport, La., directing Oscar-winner Forest Whittaker and action superstar Bruce Willis. That’s actually a better story than the one in the movie — and it’s told without the flashbacks.